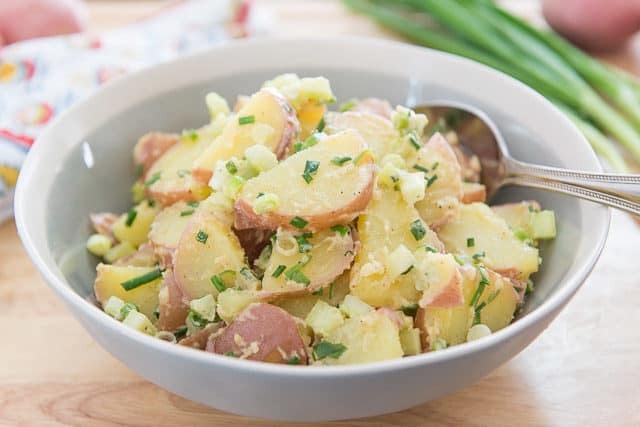 This Red Potato Salad recipe is the perfect potluck side, or lunch side for work or a picnic. It’s easy to make and has lots of fresh flavor and texture. 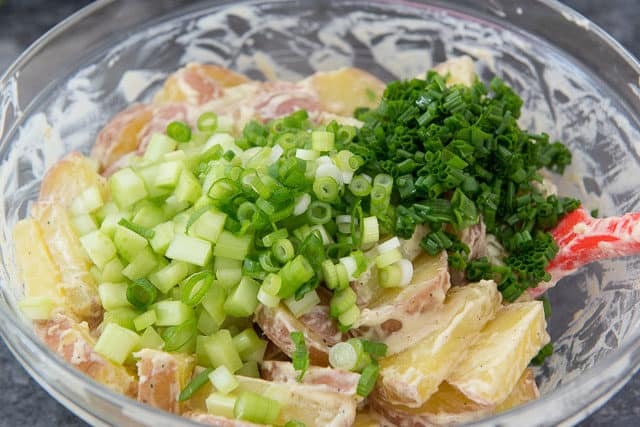 What makes or breaks a potato salad is whether there’s lots of flavor incorporated into the dish. Otherwise, potatoes can be quite bland and boring. That won’t be a problem for us today! It’s actually easy to accomplish this with relatively minimal ingredients! When I go to parties in the summer or on a picnic, I’ll almost always bring some sort of sturdy salad like this. Salmon Salad, Cranberry Chicken Salad, Caprese Pasta Salad, and Egg Salad are some of my other go-tos. It’s truly one of my favorite recipe categories! Start with the dressing so it’s ready to go for when the potatoes are hot. That way they absorb the dressing and flavor really nicely. I love the combination of fats here, with the fruity flavor and aroma of the olive oil, and the creamy classic flavor of the mayonnaise. 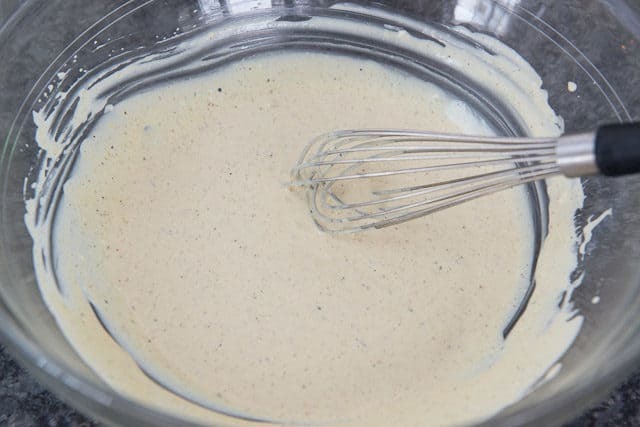 It’s so much better than a mayonnaise-only dressing. Also, if you have 10 minutes to spare, I recommend making some homemade mayonnaise for optimal flavor. I think red or white wine vinegars are by far the best acids here, but champagne vinegar, sherry vinegar, and apple cider vinegar work too. I recommend “waxy potatoes,” like red potatoes or yukon gold, over the starchy ones like russet. They hold up better, whereas russets can fall apart into mush. Slice (or chunk) some red potatoes and put them in a big pot. How I cut them totally depends on my mood, and both work great. Bring the potatoes to a boil over high heat. How long do you cook red potatoes for potato salad? It depends on how you cut them up, but about 5 minutes after the water is boiling, or until fork tender. Then drain them in a colander, and let them sit for a few minutes to let the steam escape a bit. You can either serve this warm (which I love) or you can chill it for a few hours before enjoying. Potato Croquettes, Steak Fries, and Potato Gratin are some of my other favorite potato dishes. I have a whole section of potato recipes in my recipe index if you want more ideas. Enjoy! If you want to make this red potato salad for a crowd, you can scale the recipe as needed. 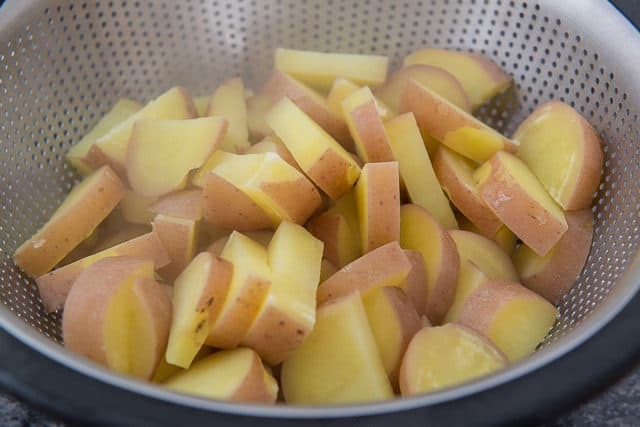 You may need to boil the potatoes for longer since it may take longer for the pot of water to reach a boil. 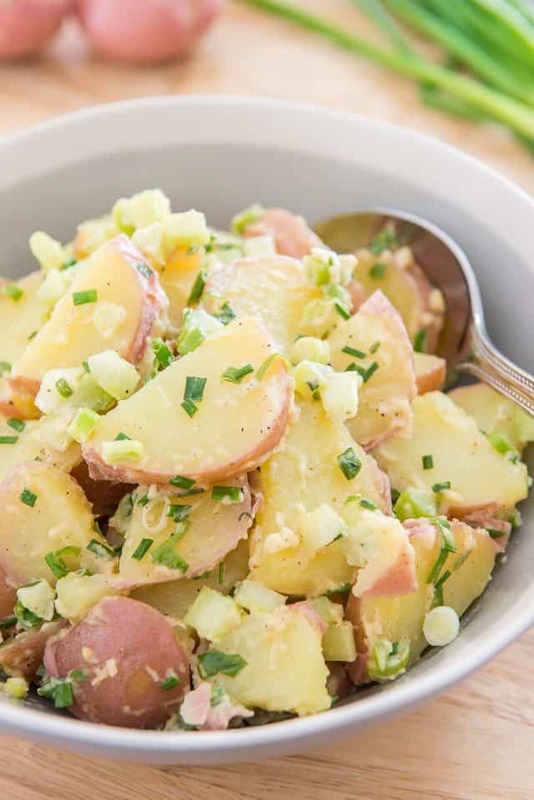 Is this potato salad healthy? That means different things to everyone, but it is gluten-free, dairy-free, vegetarian, and paleo. Can potato salad be made ahead? Yes, I’d only make it up to 1 day ahead though, so the flavor is still fresh and at its peak. How many days will potato salad last? In the fridge for about 4 days before the flavor starts to deteriorate too much. This Red Potato Salad recipe is packed with flavor, easy to make, and perfect to take to potlucks and picnics! 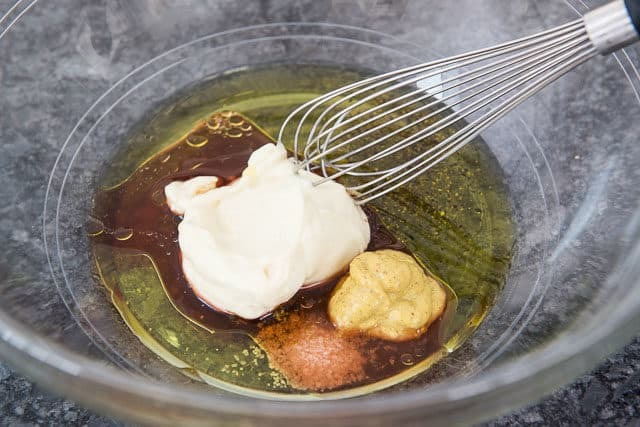 In a large bowl, whisk to combine the mayonnaise, olive oil, vinegar, mustard, 1/2 tsp salt, and 1/4 tsp black pepper. 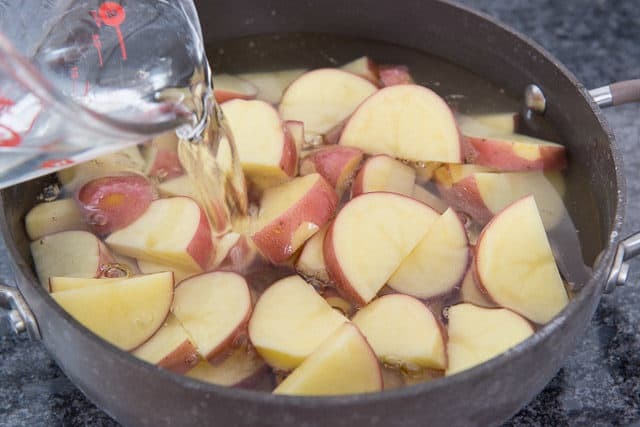 Place the cut up red potatoes into a large pot, and fill with enough cold water to cover the potatoes, plus an inch. Bring the pot to a boil over high heat, and cook the potatoes until fork tender. The time will really vary depending on if you sliced the potatoes or cut them into chunks, and how large, but for me it usually only takes about 5 minutes once the water is boiling, about 10-15 minutes total. Once the potatoes are fork tender, drain them in a colander and let them sit for a few minutes for the excess steam to come off. 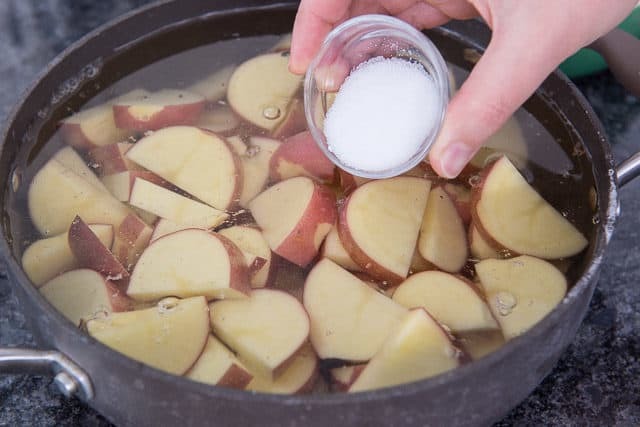 While the potatoes are still warm, toss them well with the dressing. Stir in the celery, scallions, and chives, then serve warm or chill for several hours before serving. Enjoy! Post updated with new pictures, writing, and more tips in August 2018. Originally published July 2014. Thanks Joanne for this recipe. I’m going to make it this weekend for a family BBQ. I love the dressing–just the right balance of creaminess and tang! I could use that on my chicken salad even! I’ve been looking for a solid potato salad recipe for ages. Thank you!!! This is exactly what I wanted. 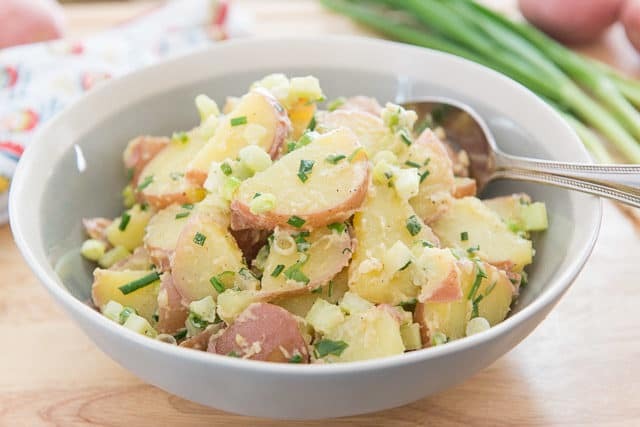 Love this lighter potato salad. 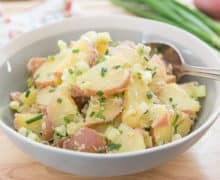 My go to recipe for potato salad with all things bbq. I sometimes add sour cream to replace half of the mayonnaise, but usually just do it was written and it’s perfect.